There is no information on the WahVision (Work At Home Vision) website indicating who owns or runs the company. The WahVision website domain (“wahvision.com”) was registered on the 24th of September 2012, however the domain registration is set to private. WahVision has no retailable products or services. Instead, members pay a monthly membership fee and are then able to “purchase” various positions within the WahVision compensation plan. Bundled with monthly membership are advertising credits and access to an e-book library, which the company claims ‘is going to be updated each month with more ebooks‘. The WahVision compensation plan primarily revolves around members paying monthly membership fees and purchasing positions in the WahVision compensation plan. Details on this are a little sketchy, but it appears to be a 3×7 matrix members are automatically entered into when they join the company. Commissions appear to be paid out depending on how many positions are filled in a member’s matrix (either by direct recruitment of new members or indirect recruitment via an affiliate’s down or upline). This appears to be some sort of investment scheme, with members purchasing a “revenue share package” on the guarantee of WahVision paying out a 200% ROI over time (funded by new member investments). A 10% referral commission is also paid out on any investments made by members an affiliate recruits into the scheme. Upon paying their monthly membership fees, WahVision members are given “3 new cycler positions each month”. The company doesn’t clarify the make up of the cyclers but typically once enough positions have been bought a position “cycles” and a commission is paid out. Note that 50% of all commissions earned by WahVision affiliates must be re-invested back into the scheme via the purchase of positions in the compensation plan. The company claims this is to “ensure longevity and growth”. Membership to WahVision is $10 a month, with participation in various aspects of the compensation plan costing extra. a vision created for all people who have a dream or vision to create an income from the comfort of their own home. Unfortunately the simple fact of the matter is joining a company, investing money and earning commissions when new members invest and/or purchase positions in matrices is just the same old Ponzi scheme games that continue to plague the MLM industry. Each level of the WahVision compensation plan is 100% affiliate funded and either dependent on the continuous recruitment of new affiliates, continuous re-investment of commissions by existing affiliates and/or new investments made by newly recruited and existing affiliates. If either of the above scenarios stop then the compensation plan grinds to a halt. Meanwhile no products are sold to retail customers, meaning all WahVision are doing is shuffling affiliate money around to those who got involved in the Ponzi scheme earlier. The 50% re-investment rule with prolong the collapse of the Ponzi scheme, but ultimately does not solve the problem of existing liabilities owed exceeding new money flowing into the scheme (a Ponzi scheme inevitability). 4 Brand New Exciting Options to Join All Hit Deals ! Allhitdeals has launched 4 new options to join. This scheme is launched just today. Lots of good news for the new members who are planning to join. This company is creating history in Indian MLM and the management of Allhitdeals is very sincere and dedicated to the business. 3 Days 2 Nights Holiday Voucher for "Two Adults and two kids"
Free Integrated Internet Learning Course. So, its high time that any new member looking to start a lucrative part time / full time business, its this opportunity the best one to start in the new year. At Ujala Group is a wealth management company which provide products that meet the diverse needs of clients, to achieve superior investment results, and to give an exceptional level of client service. Forex currency exchange, Foreign Exchange or FOREX is simultaneous purchase and sale of the currency or the exchange of one country's currency for the one of another country. It is one of the largest markets in the world. 5)20% will be deducted immediately for bank transfer. The below notification was released by RBI. 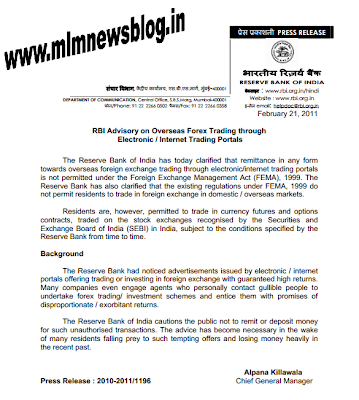 People who are investing should know the rules framed by RBI before they invest their hard earned money in to Forex. There are some foreign companies running aggressive campaigns in Internet. The problem is they share testimonies which shows extremely high returns with the investors name and details. People should be well aware about the FEMA act guidelines framed by RBI. 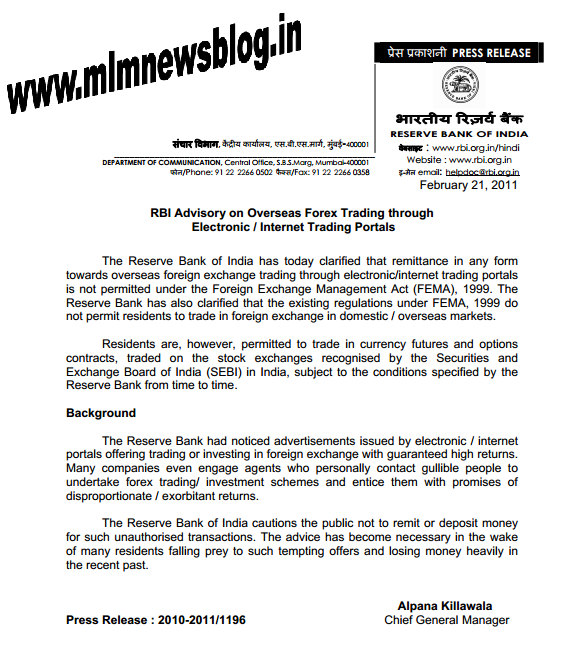 In this press release RBI has actually warned individuals that are involved in Overseas and also residential Forex Investing. The overall meaning of the below letter from RBI shows that as an individual, one should not engage in Forex trading sitting from India. If somebody approaching you to involve in Forex trading, show them this notice and get yourself clarified before you invest your hard earned money in to Forex market. 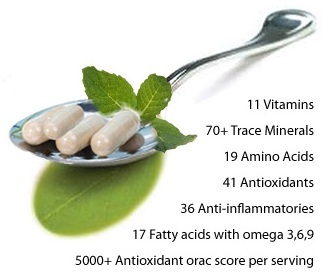 Moringo Organics is a US-based nutraceutical development company incorporated in Delaware and headquartered in Florida. Started in 2012 with healthy line of products for everything you require for your wellbeing needs. Moringa oleifera, also known as Tree of life, clarifier tree, horseradish tree and drumstick tree, has been used for centuries by people living in asia and many parts of Africa. There are nine ways to make money from the compensation plan of Moringo. MORINGO ORGANICS Compensation Plan is both powerful and generous & guarantees a maximum payout of 60% of total company GV. Platinum systems from Mumbai which has been running for about the past one year has introduced a new plan for its new members. As per the new plan, the joining amount will be Rs.1999/- There are six innovative products introduced for the members to choose. The products will be delivered within 15 days from the date of joining. The joining amount will be returned (Rs.1999/-) on completion of the first pair of 1:2 or 2:1. After that for every 1:1 pair, Rs.500/- is paid as binary pair commission. Closing every 12 hours and capping up to 5 pairs per day. For the new members, they can purchase additional products with a discount of Rs.2000/-. This is an additional benifit the company is providing for the new members only to encourage product selling. Overall, the plan looks very attractive now. For the existing members now it is easy to approach even anyone who is fresh to MLM with the attractive mantra, money back guarentee. It is expected that Platinum systems will make good progress in the coming days with the new scheme. The biggest positive point about Platinum systems is that they have not delayed any payouts till date from the date the company started. Platinum Systems Private Limited has launched two more new products this week. 2. Digital wireless security door alarm. Already the company has been successfully promoting their prototype Platinum Tablet PC with SIM with Rs.4999/-. This product has already created a jolt among the Indian gadget industry. The networkers are surprised with the fact that they get a real worth product for the joining amount which is useful to anyone in their family. In addition, attractive binary income has been paid (Rs.500/-) for every 1:1 matching pair. The business is hitting all the states in India and the company has already started appointing franchisees in all the states. Another good news is, the company has tied with an existing service company having established with more than 350 service centers in India. This company is going to hit the Tablet PC market in a big way in the coming weeks. If you are searching for a real good binary company to start up, join platinum immediately. The company has more plans to launch more digital products in the near future. So, don't wait hurry! The following official communication from the SAOL Company which says that the final disposal of the case is expected on 8th August, 2012. Yesterday was a very important day for us as our matter was heard by Hon'ble Supreme Court and we got a favourable response in the interest of all our panelists. We are happy to share that Honourable Court gave a patient hearing to our learned counsels and the other parties. The Hon'ble Court heard our plea that EOW is making baseless objections in sharing our data and we are not getting any cooperation from EOW in resolving the matter and disbursement of money which is already lying with the Registrar of Hon¹ble Supreme Court. Based on our pleas, the Hon¹ble Court directed EOW to hand over the data to the Hon'ble Court on the next date fixed as 8th August for final disposal. This indeed is a great achievement as we are inching close to our victory. What normally takes years to achieve, we have been able to get in just 3-4 months. We will use this interim period to consolidate our position which should help in early resolution of our problems. We would also like to point out that Mr. Navnit Khosla has been consistently pursuing the matter in one form or the other and in different forums despite AISPA members handling his claims and his affidavit in that regard before Hon¹ble Mumbai High Court. We fail to see his ulterior motive to derail the process of disbursement of money to panelists who have chosen to exercise the company’s exit option. We would also like to share with you that we are taking legal opinion regarding early resumption of our business in India. We understand that some misguided people will try to spread panic and create doubts in the minds of our people. Also, do not give any of your personal details to any unauthorised person or on website which claims to be collecting data on behalf of the company. We once again urge all our Speakasian family members to remain calm and patient as the resolution to our problems are well within our sights. 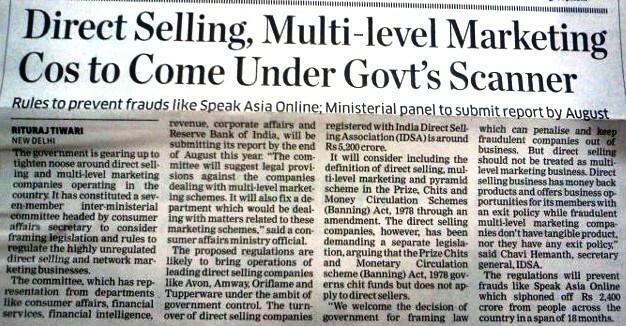 Below article is published in "The Economics Times" newspaper on July 26, 2012. Source: The Economic Times, July 26, 2012. 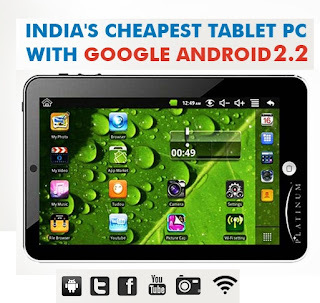 Platinum Tablet PC is the India's cheapest tablet loaded with Google Android 2.2 is now available through network marketing.The product is a real value for money and is useful for all kind of people. By paying Rs.4999/-, you will get a brand new platinum tablet PC delivered to your home immediately after your joining. You will also get a username and password to start your business. Mr. "X" as Company's intependent business distributors (co's IBD's) can earn binary also. i.e. Capping 5 Pair per day. Power leg will be carry forward. Weekly Closing on Every Saturday. Payout Distribution Weekly. Payment will be credited in your account every Tuesday. Please fill your details in below form and submit. You will be redirected for presentations and videos about this golden opportunity. MX Fast Money (MXF) based out of Tortola in British Virgin Islands is one of the greatest home businesses in the world with daily commission payouts based on 2 x 2 matrix plan. At only $40 one time to join for life, you earn over double every cycle, again and again. completed a "CYCLE" and instantly earn over two times your $40 one-time joining fee, which in the case of MXF is $100 commission. JAMES LEE VALENTINE, the founder of MX FAST MONEY is known as The Man of Power! From England, he is an empowering author, dynamic speaker and inspired creator of the wealth mastery Empowered Millionaire Institute. James Lee Valentine is also the author of more than 65 POWER series books based on his own unique mix of financial empowerment and personal development. Learn his success secrets and be financially empowered for life! IDSA Members list: Indian Direct Selling Association. Hariyali, a new company from Westbengal, Shyamnagar is offering Ad pasting jobs and Easy recharge based services through MLM. 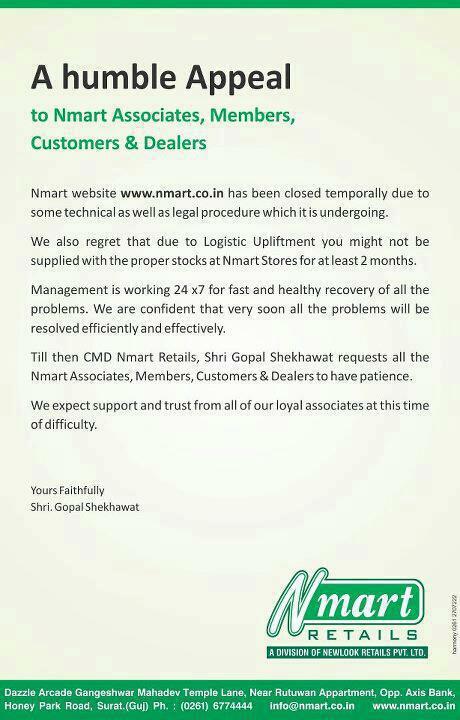 They are also planning to setup the stores all over India. It was lauched last year with binary plan. Re-purchase Income - 3% to 0.1% for level 1 to level 25 respectively in your downline. For Rs.5000/- you get 60 free repurchase vouchers worth Rs.250/-. One voucher can be spent for one month, that means you need to use your entire 60 repurchase voucher in 60 months. Incase if there is no branch in your place, no worries, company will pay you Rs.250/- cash against your voucher. Some people think that forex trading is like one another way of making money like share trading. But in reality it is not the fact. Forex trade differs in many ways than share trading. Usually you can open an account with a start up in the range of USD $20 or above. The trade involves buying and selling currencies through currency exchanges such as EUROUSD, GBPUSD, etc.., You can trade for 24 hours between Monday and Friday. Saturday and Sunday is a holiday and the market remains closed. To buy one lot ($1000 USD), you need not have to fund your account for $1000, rather you can do that even with $10 by selecting a leverage of 1:100. The more the leverage you choose, the more the profit/loss, hence more the risk. Unlike day trading, forex allows you to hold your transaction for several days and months until your particular transaction meets the desired profits. For this, you should have enough patience to wait and earn profits. For those who wants to make quick money, they trade at high volume with high leverages. There are some experts providing quality tips about daily market conditions. A smart trader simply subscribe to these expert tips and trade accordingly to earn maximum profits and avoid losses. However, these tips are not always correct. On an average, about 70% of these tips are realistic. If you engage in Forex trading without proper education, you might end up losing your whole money. Try with a demo account for a period of 15 days and observe your performance. Once you gain sufficient knowledge about all trading techniques, it is suggested you open a proper trading account and start trading with live money. If you understand the concepts and trade with safe numbers, forex is a good option for one to make decent profits.